Beautiful Rancho Mirage Country Club located off Bob Hope Drive, near the newly completed Sunnylands Center. Rancho Mirage Country Club is located on the Southeast corner of Bob Hope Drive and Frank Sinatra Drive in Rancho Mirage, California. . The 18-hole course at the Rancho Mirage Country Club was designed by Harold Heers and features 6,111 yards of golf from the longest tees for a par of 70. 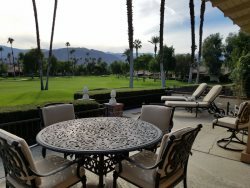 While the semi-private golf course remains open to the public, Rancho Mirage Country Club provides the feeling of a private club from the moment guests enter the gates to the property. A welcoming and spacious clubhouse plays host to the PGA Professional Shop full of all of the latest in golf equipment and fashion trends, the Players Grill for casual before or after golf food and beverage service, as well as superb banquet and event facilities for groups of up to 250. There are 8 lighted tennis courts open to owners guests. A large fitness center, snack bar and dining room are located in the clubhouse.